Dr. John Derry, HIU President, and other University administrators assisted neighboring Cal State Fullerton in honoring Young Jin Choi, the ambassador of the Republic of Korea, during the his visit to celebrate the 60th anniversary of the alliance between South Korea and the United States. Ambassador Choi praised American veterans of the Korean War. He spoke of the many benefits of the U.S.- Korea alliance, attributing much of South Korea’s growth and prosperity since the war to the friendship and support of the United States. In particular, he focused on the good relationship fostered by international trade and commerce. With that relationship in mind, the ambassador turned to a discussion of the rise of China as a global power and the challenge posed by North Korea’s ongoing nuclear tests. 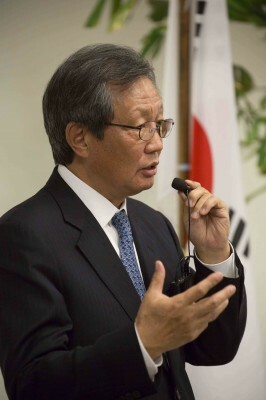 He suggested that the U.S.- Korea alliance provides a model for approaching these international challenges: using diplomacy combined with trade and cooperation, rather than military force. Other guests included Consul General Yeon-sung Shin, Fullerton Mayor Bruce Whittaker, and U.S. Congressman Ed Royce. President Derry presented the ambassador with a crystal globe with a quote from President Ronald Reagan regarding world peace.